Pure-Breed Airedale Terriers, Sophisticated for the Show Ring, Loving for the family. Bred for temperament ,character and conformation. Your New Puppy,click to enlarge. Welcome to YELOMAN Airedale Terriers.Purebred and pedigreed with Registering Body. I owned my first Airedale when I was 6yrs old, that was when I first entered the show ring and my life long love of Airedales began.Showing,breeding and becoming one of the group of very special people who are the custodians of the breed. All Yeloman Airedales are house dogs and very much part of our family,we Participate in obedience, conformation showing,bush walking or just frolicking on the beach. 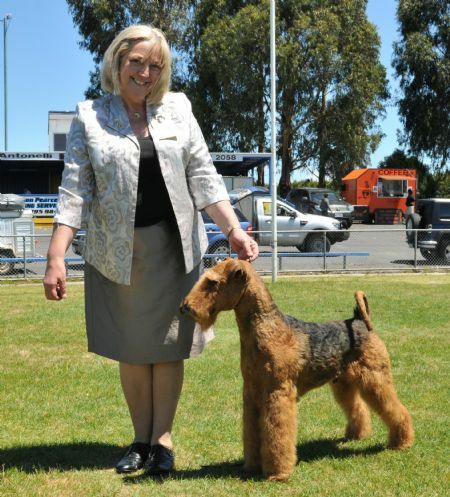 In 2007 I had the great honour of being elected as the President of the "Airedale Terrier Club of Victoria" and 2011 elected as Vice President of West Gippsland Kennel Association,all breeds. Today I am President of Morwell,Traralgon Kennel Club,all breeds and committee member of Sporting Terrier club of Victoria. I will then respond asking you to ring me or send your phone number to me.